A graduate of Bachelor of Science in Psychology. Started working at the age of 16 and has been employed ever since from a marketing staff to managerial level in several multi-national companies. 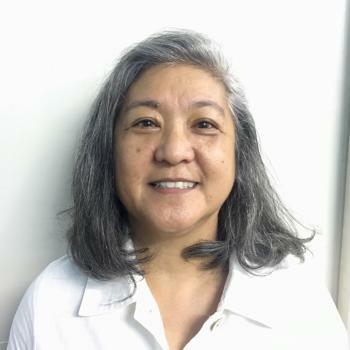 Reaching 50 years of age, semi-retired with 2 children that have also finished their collegiate courses, she is currently managing and operating a laundromat to continue to be productive. Loves the German Shepherd breed of dog (3 in her lifetime) and has a substantial collection of National Geographic magazines with the oldest dating back from 1932. A native of Angeles City, Pampanga, the Philippines with a genealogy that can be traced back from the 1800s. A wife, a mother, a friend, a teacher. Thank you so much Carol-san! Actually I didn't have enough confidence to take the grammar lesson but you've tried to cheer me up in our lesson. I am glad to take the lesson with you : ) I am really appreciate your kindness. I never give up to study English. Cheers! It’s my pleasure and privilege to spend time with you!